Our Fox Heating & Cooling Specialists know that you want to the best for your home, which is why we recommend Daikin heating & cooling products. Daikin natural gas furnaces are up to 98% efficient, providing energy savings as well as superior home comfort. Daikin is a world leader in heating and air conditioning and innovator of HVAC technology. The company was first introduced to the US market through their top quality line of ductless heat pumps and has now expanded offerings with the Daikin ducted product line. Whether you are using a stand-alone furnace to heat your home or combining an air handler with a Daikin heat pump or air conditioner, there is a broad range of products to choose from. Fox’s Heating & Cooling Specialists recommend high-quality Daikin gas furnaces that provide excellent heating at a great value. 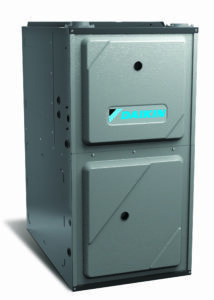 Daikin furnaces feature variable speed ECM motors, designed for your indoor comfort and superior energy efficiency. With 9 different models, we can provide you with a range of choices to fit your lifestyle and budget. Daikin air handlers provide high-quality electric heat and link seamlessly to Daikin air source heat pumps to create energy-efficient heating and cooling. Daikin HVAC products also come with excellent warranties including up to 12 years limited parts and replacement, and a lifetime heat exchanger limited warranty. Ask your Fox HVAC Specialist for details. Choosing a furnace sounds simple, but there are two aspects that can influence your comfort and heating costs. Here’s an easy way to understand some of the choices you will have. Your Fox Heating & Cooling Specialists will walk you through all of your options during your free consultation. 1- Stage, 2-Stage or Modulating Stages. Think of stages as operating speeds. A one stage basic furnace turns on, blasts hot air to reach your desired temperature and then turns off until the temperature drops and it turns on again. As most of us have experienced, between cycles, as the temperature drops, the outside edges of rooms tend to get drafty. A two-stage furnace has a high and low-speed operation. When it kicks on, it will start high to fill the room with heat faster, and then move to low to save energy. It runs longer and provides significantly greater comfort. The Daikin Unitary modulating furnace has up to 100 stages! Combined with a variable speed motor, this furnace manages fuel use with maximum efficiency to keep at exactly the temperature you have set. A bit like driving in cruise control, the furnace runs smoothly, modulating its output up and down to keep you continuously comfortable, and to eliminate wasted fuel. That is how this type of furnace can be 98% efficient. Energy Efficiency – 80% AFUE to 95% AFUE to 98% AFUE. There’s something for everyone in the Daikin product line including furnaces that run at a basic 80% efficiency, all the way up to super efficient 98% furnaces. AFUE (annual fuel utilization efficiency), is the national standard measurement of the efficiency of a furnace. All gas or propane furnaces are rated on this standard. 80% AFUE means that 80% of the gas used to create heat actually ends up as heat. The other 20% is lost as waste in the process. 98% AFUE means that only 2% is lost as waste. Yes, that is an automatic saving of 18% on your heating costs. WHAT MAINTENANCE WILL A DAIKIN GAS FURNACE REQUIRE? For Seattle homeowners who have gas, propane or oil furnaces, an annual furnace maintenance is recommended by Daikin. It is a standard best practice recommended by Energystar (EPA). Maintenance of your fuel burning Daikin furnace will keep that equipment working as expected and maintain the energy efficiency over time. Contact Fox to schedule your annual furnace service. Fox’s Heating & Cooling is a Daikin 3D Dealer, which means the Fox HVAC team is manufacturer trained and committed to providing you the highest standard of care. They keep on top of Daikin furnace installation methods and service needs with continuous training. Talk to Fox today!